Since we do not have much time this morning and I am feeling a little ill, perhaps we will do the Lung - reading transmission for Ngondro Practice - in Tibetan only. First, I will answer some of the questions and then we will do the refuge ceremony. 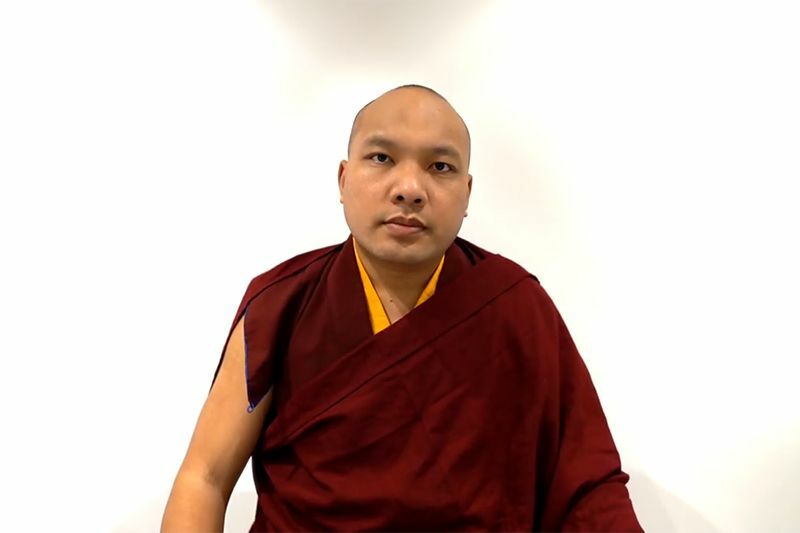 Q: What is the profound meaning of reciting “Karmapa Khyeno”? A: The meaning of “Karma” is action or activity, and “Karmapa” means the one who does the activity. The activity here refers to the activity to benefit beings, and that is the main concern of the Buddhas in the ten directions and of the three times. As to the origin of this title, it comes from a pure vision that the first Karmapa, Dusum Khyenpa, had when he was sixteen years old. As he first took the monastic vow, he had a vision that all of the Buddhas, Bodhisattvas, and the 100,000 Dakinis made a black hat out of their hair, and then offered it to him to wear. He was then consecrated or enthroned as the doer, the one who does the activities of all the Buddhas and Bodhisattvas. It was at that time that Dusum Khyenpa received the title “Karmapa”. Additionally, the name “Karmapa” does not necessarily refer to one particular individual. It can also be a general name for all Dorje Lopons – the Vajra Masters, or Vajra Acharyas - who do the activities of the Buddha. Therefore, it can be regarded as the general name for all great and genuine lamas. It is acceptable to call every lama “Karmapa”. Buddha once said, “When the Dharma is nearing extinction, I myself will come as Vajra Masters or Vajra Acharyas, and then do the activity of the Buddha.” What is the activity of the Buddha? It is to bring out the Buddha nature in people – the side of them that is positive, white, or light. To bring that out is to do the activity of the Buddhas. So therefore, when we talk about the “Karmapa” or say “Karmapa Khyeno”, it is also generally to bring out the positive action of the Buddhas in all sentient beings. Finally, in “Karmapa Khyeno”, “Khyeno” means “please think of me”. With this, we remember the lama again and again, constantly keeping in mind the positive qualities of the lama and praying to him or her. Milarepa once said, “When I am in a crowd, I call for my lama from my heart.” In the same way, you can evoke the lama, holding him or her in your heart. It is not necessary to say it aloud. But if you want to say it aloud, there is also nothing wrong with that. Q: Could His Holiness please give some advice for supporting a non-Buddhist as they come close to death, especially if it’s your parent? A: Whether one has entered into Buddhist practice or not, everybody has the opportunity to be reborn in a pure or positive realm. They do not necessarily have to be practicing Buddhism to have a positive life next time. The most important thing is what circumstances or what state of the mind the person who is dying has at the time of death. That is very important. If we can create the circumstances for the person to have a positive state of mind as they are dying, I think that will be very helpful. Because even people has not had the opportunity to do many positive things throughout their life, if they have a positive state of mind at the time of death, that could directly influence their next life. Therefore, it is very important to create the situation or atmosphere that will evoke a positive state of mind in the one who is dying. There is a story that relates to this. Once there was a man who had been a butcher all his life. Because of this, he had killed many beings. At his time of death he met a Bhikshu, and this monk told him about the Buddha. He felt such devotion and inspiration that he died with one hand doing homage prostrations. Then, sometime after he died, all of his family members had a dream. They all dreamt that the butcher came to them and said, “I am being reborn as a piglet at our neighbor’s home. You will immediately recognize me when you go because one of my feet is a human hand.” When they went to the neighbor’s and looked, they actually found a small pig with one human hand. Therefore, they bought it and took the small pig to the monastery to save its life. This is not just a story; it is a fact. I even saw the photo of the small pig. So therefore, one’s state of mind at the time of death is very important. Q: Everything we know in the West is questionable. Please give us a simple message of hope to take home and share. What is your view on the highly-prophesied shift of consciousness reported to be in 2012? A: When I talk about refuge, I can then incorporate the first part of the question, the message of hope. In regards to the second part, it is not impossible for people’s minds to make a shift. I believe there is a possibility of that happening. Now we will leave the questions there and do the reading transmission, the Lung, for the ngondro, or preliminary practices, which I have composed. This was created especially for foreigners, the non-Tibetans. It is also for myself, though. The year before last, I was asked to give a teaching on ngondro. To finish teaching traditional ngondro in three days was not possible; it was even not possible to read through it in that short a time. So this version is also for me. I understand that many of you are starting to do the ngondro practice. Maybe in the afternoon I can give a brief teaching on this in a concise way, especially the Vajrasattva practice and Guru Yoga. Last time when I taught Guru Yoga, I did not allow any recordings to be made, so this time maybe I can say something which you can also put on record. Now I will perform the refuge ceremony. Taking refuge means that we find a source of refuge, a support. For example, when we have parents who love us very much, we are encouraged; we gain hope and assurance. Thus, refuge provides hope, assurance, and courage. Today, the people of the world are experiencing many crises, including the economic crisis. They have many different problems that trigger a loss of hope, and lack complete confidence in all things. They struggle to find something they can depend on. Therefore, by taking refuge, by finding a support, maybe we can generate a new hope and confidence. When we were very young and undesirable things happened to us – such as being frightened by something – we sought refuge by spontaneously calling Mother or Ma. We ran towards our mother. In the same way, when we face the sufferings or difficulties of samsara, when the problems of the world loom over us, we need to find some kind of protection or refuge. If we cannot discover something outside ourselves, then we must find something inside, a spiritual refuge, something that will give us inner protection and inner strength. The lama thought for a while, and then replied, “If that happens, it is not a problem. I can climb up Mount Everest and disappear and then nobody will find me.” His friends said, “No, no, that’s not possible. There are mountaineers, and they will find you. They will talk about the lama they saw, and soon everybody will know about it. They will all come there, and again they will bother you”. We can view the Buddha’s teachings in a similar way. The Buddha Shakyamuni came and passed away 2500 years ago. Though this embodiment of wisdom and compassion no longer exists, we should not be worried or sad. His teachings and activities to benefit beings are still here; the people who genuinely understand and practice those teachings are here as well. Thus, we can see a continuing presence of those people who represent his body, speech, and mind today. However, just to have exposure to these teachings and the people who are still practicing and presenting them is not enough. We need to practice these teachings ourselves. We should rely on genuine lamas, get close to other practitioners, and apply the Buddha’s teachings accordingly. If you practice and study, there is no difference between that and actually meeting the Buddha. Therefore, if we can study the Dharma and apply it ourselves, we will find that protection, that confidence within ourselves. Human beings have a highly developed brain with an advanced capacity. We can say there are three reasons why the human brain has developed so much. One reason why we are advanced is the transmission of experience from past generations. The second reason is that we do not simply copy what others needed in the past and remain there. We also use our own intellect and find our own new ways of doing things through our intelligence and wisdom. The third reason is that life is full of ups and downs, positive experiences and suffering. Because of this, we also need people: we need friends, companions with whom to share our joys and struggles. We support each other and we go forward. Because of these three reasons, the human brain and human life have become quite advanced. This is analogous to the three sources of refuge. We need the Buddhas to give us guidance on how to free ourselves from suffering and pain, and how to find lasting peace and happiness. Then there is the path, the teachings on how we can accomplish this while using our own understanding. Finally, there are the friends who we work with, those of us who support each other along the path, our companions or the Sangha. Now there is not much time left, so we will do the refuge ceremony. We have to think of Buddha as the guide, the teacher who gives us guidance. Then we must think of the Dharma as the path and the Sangha as the friends or companions who go with us. So please repeat the refuge prayer with me. Those who can kneel, please kneel. Those who cannot kneel, please just fold your hands together at your heart. For those who took refuge vows, you have to try to observe those refuge vows. You all should know what to do and what not to do. You all come from faraway places, from many different countries. When you go back home, you need to carry something back with you. So therefore, in the afternoon I will teach a little bit on ngondro so that you can continue practicing that. We will also do some meditation together. We had asked people to bring stones from every country in the world, and had used them to build a stone stupa under the bodhi tree. During the Kagyu Monlam, we said prayers and blessed those stones. So now I would like to give each of you a stone from this stupa as a gift. As you bring the stones with you back to your country, the prayers and blessings carried by the stones can also spread to every corner of the world. In the same way, may the joy and peace of the Kagyu Monlam pervade the world. This is my aspiration. It is not that you will receive a stone from the country you are from. I will just give one stone to each of you. Maybe an American will get a stone from Iraq, or a Chinese will get a stone from Tibet. I just give the stones out, but I do not know where they come from. Some people have asked me to present the Bodhisattva Vow, so I will do that now. Since there are only a few people who have asked for the Upasaka Vow, the five precepts, that is something we can do this evening in a private audience. There are many different liturgies through which you do the Bodhisattva Vow. Among them, it seems the one that is in the Bodhicharyavatara is the easiest and the best. So, to receive the Bodhisattva Vow, first we have to generate bodhicitta. And to do that, we have to think and to understand the seven point instructions of the causes and conditions. For instance, you must understand that all sentient beings have been your mother, and, remembering the kindness she bestowed on you, be grateful for that. Or you can feel the equality of yourself and others, understanding that it is important to exchange the happiness you are experiencing with the suffering of others. Inspired by strong compassion, you aspire to work for the elimination of the suffering of all beings. And in order to do that, you must find a way to attain enlightenment. By thinking in this way, there are two steps to this process: the wish to eliminate the suffering of all beings, and then, for that reason, the need to first liberate yourself. It is very important to start with this kind of understanding and strong aspiration. As we think ‘for the benefit of all sentient beings, and the suffering of all sentient beings’, we also have to consider the container of sentient beings - this world. This world is the container in which all sentient beings live; it has the capacity to provide for their necessities in this world. Therefore, we need to be aware that the environment is essential, and we should acknowledge that we have been quite unaware of the destruction of the environment. For instance, we destroy the forests and other parts of the environment in a horrible way without any compassion or consideration. Therefore, the environment should also be an object of our compassion and concerns. We should have a clear understanding of things and know what we should and should not do. Motivated by this, we then wish to obtain enlightenment. That shall be the way that we generate bodhicitta and aspiration. Here we have talked about how to generate compassion for beings and the environment. Simply having this aspiration in and of itself is very good. However, in order to really obtain the Bodhisattva Vow, you need to put your aspirations into actions. You need to be empowered by the motivation that: “In order to accomplish this, I am willing to take practical actions.” You should make the vow that: “Until I obtain enlightenment, I will continue to perform the various activities of bodhisattvas, such as the practices of the six paramitas, etc.” This aspect of bodhicitta is what we call “action bodhicitta”. Additionally, it is very important to understand that we have to make aspirations according to our level of mind strength, courage, and attainment. It is very good to generate bodhicitta and take the Bodhisattva Vow. This aspiration, by itself, contains a lot of merit. However, if you do not know how to work at your own level of strength, then it might not be as beneficial because you will feel you have to do something that you cannot do. By analogy, when we take the Bodhisattva Vow, we are inviting all sentient beings as our guests to enlightenment. So therefore, it is very important that we accomplish what we have promised to do. It will be quite disappointing if we regret that promise or we are not able to accomplish it, because then we are essentially deceiving people. Therefore, make your aspiration according to your own level and train on it step by step without giving up. Doing this is very important. Generally, it is of great benefit to aspire to receive the Bodhisattva Vow. It is said in the sutra that the merit of generating bodhicitta, the aspiration to benefits beings, when given a form, will be so vast that it will pervade all space, especially, if you give rise to action bodhicitta. Then, even if you are not doing anything – if you are sleeping or completely distracted - that merit will still continuously increase. This description of the benefit of arousing bodhicitta is not just words. There is a profound meaning to understand. When we say that “if the benefit of generating bodhicitta has a form, then it will pervade all space”, this is not merely words. The Buddha had told us in the sutra that wherever there is space, there are endless beings; wherever there are endless beings, there is limitless defilement; wherever there is limitless defilement, there is boundless suffering; wherever there is boundless suffering, there is the need for our kindness and compassion. Therefore, when we think of our bodhicitta in this way, we can then say that bodhicitta covers all of the places where there are sentient beings. If there are sentient beings wherever there is space, then we might start to feel that our bodhicitta is truly covering all space and reaching all sentient beings. In Tibet, for instance, in the 19th century and the beginning of the 20th century, most people did not know much about the different countries of the world. Maybe they had heard about America or some other big countries, but they didn’t even know about Russia. Sometimes when people talked about Russia, or Eluosi, it was something that turned into a prediction like, “In the future there will be some people coming called Eluosi, or the Russians, and they are so strange that they eat human beings.” They thought of it like a fairy tale or myth. They didn’t know any details about the countries of the world. But at the same time, they had this understanding that wherever there is space, there are sentient beings. Whoever sentient beings are, they need to be loved and to be free from suffering. Therefore, their compassion, bodhicitta, was also there for them. So even though they did not possess a detailed description of the various countries in the world, they cared for all beings and had this understanding of covering all sentient beings throughout space with a sense of compassion. With this, when you truly give rise to bodhicitta, you shall have all beings, the mother-like beings, in your heart. In this way, your love, compassion, and care will spontaneously pervade all space. Thus, we say that when you generate bodhicitta, the virtue and merit of that is boundless throughout space. So maybe there is no more to be said. If we just talk, talk, talk, then our lives are just full of talking. So we should not talk too much; we should just do it. So let us do the Bodhisattva Vow. Perhaps it is better for me to say it in English so that you understand more. However, I am not very well prepared, so it is better for me not to do it in English; otherwise, you might have difficulty understanding me at all. First we will do it in Tibetan because of my attachment to Tibetan. Those who can kneel please kneel. [HHK] Those who can’t kneel, then that’s OK.
Then join your palms together. Since we have done a lot of practice before, we assume that we have already accomplished the accumulation of positive deeds and merits, and are ready to receive the Bodhisattva Vow at this time. When we complete the third repetition, those of you who want to take the vow, imagine that you have received it. For those who have just generated bodhicitta, you shall also feel that you have received it. Following that, we will go through the English text simply to clarify and strengthen it in you. Nonetheless, you will have obtained the Bodhisattva Vow at the end of the third repetition in Tibetan. [HHK:] “Until I reach enlightenment’s essence, I go for refuge to the Buddhas, to the Dharma, and the assembly of bodhisattvas, too, I go for refuge. so, too, shall I, to benefit wanderers, arouse the mind of bodhicitta. [HHK:] OK, makes clear, I hope. Now you can reflect on that and I will read the words on my own. Now we will do something from the ngondro practice. We cannot discuss all of the ngondro practices, but we will do the Vajrasattva and then the Guru Yoga practices from this short book. This, my abbreviated sadhana of the four uncommon preliminaries, is based on the ngondro text composed by the 5th Sharmapa, Konchok Yenlak. This is a very old text. The Vajrasattva meditation and recitation practice, which purifies negativities and obscurations has two parts. Clearly visualize at Vajrasattva’s heart center a moon disc, upon which sits a HUM, encircled by the mantra garland. Due to your supplicating him, a stream of amrita fills his body and descends from his right big toe, entering the Brahma aperture at the top of your head. All your obscurations and past negative actions, embodied in a substance that looks like ink or dark smoke, leave your body as all of your body’s parts are filled with amrita. While doing this visualization, recite Vajrasattva’s mantra as many times as you can. Then you recite the Vajrasattva mantra. We have transgressed the three vows and the victor’s commands in body, speech, and mind. Saying this, confess and resolve not to repeat your misdeeds. Vajrasattva says, “Your misdeeds are purified,” and is pleased. He melts into light and dissolves into you. Rest in equipoise. Second, between sessions, whatever afflictions or thoughts that arise, be mindful of them as soon as they arise. Completely cut through them and rest in freedom from fixation. Whatever sentient beings you see, hear, or think of — especially those who have done terrible misdeeds — visualize Vajrasattva above their heads and recite the hundred-syllable mantra. Basically, the Vajrasattva practice is done to purify negative deeds and obscurations. If you can rely on the four powers in order to purify these, then your practice will become stronger and more effective. The first is the power of support; the second is the power of applying antidotes; the third is the power of regret; and the fourth is the power of resolve. The power of support consists of two parts: the support of the Buddhas, and the support of sentient beings. Here it mostly refers to the Three Jewels — the Buddha, Dharma, and Sangha — and the generation of bodhicitta. It is stated in the sutra that negative karma can be purified simply by going for refuge in the Buddha, Dharma, and Sangha and generating bodhicitta. Therefore, when you do the second part of the ngondro practice, the Vajrasattva practice, you shall still begin your practice with the recitation of the refuge prayer and the generation of bodhicitta described in the first part of the ngondro practice, refuge and prostrations. You should do this regardless if you have completed this first practice or not. Maintaining this will be better for your practice. The second power is that of applying antidotes, which generally refer to any positive deeds you perform. But here in the context of the Vajrasattva practice, it refers to the actual sequential practice itself, the meditation, the visualization, and the recitation of the Vajrasattva mantra. As written in the text, first you feel and visualize the presence of Vajrasattva above your head. Vajrasattva is the union of and inseparability from emptiness and wisdom. Note that it is not enough just to think he is there; you have to really feel that he is there. In Vajrayana, it is very important to truly feel the object of your practice. Next, you fervently pray to Lama Vajrasattva that all of your negative deeds and obscurations be purified. Visualize at the heart center of Vajrasattva, a moon disk, upon which sits a HUNG, encircled by the mantra garland. Because of your strong supplication, you feel that a stream of amrita flows out of the syllable HUNG and fills up Vajrasattva’s enlightened form, and then comes out from his right big toe. It then enters into your body through your fontanel. Imagine that all of the negative deeds and obscurations of your body, speech, and mind are completely purified. You will feel that your body has become very clean like a transparent bottle, clear from both outside and inside, as all of the negative deeds and obscurations are completely removed. While doing this part of the visualization, you can think of all of your misdeeds, or you can reflect on any particular negative thing you have done, any specific defilement you have, any individual thing you wish to repent, or any particular vow you have transgressed. Then feel that it has been completely cleared up and purified. The third power, the power of regret, is to truly repent the negative deeds we have done. It is similar to having a disease in your body that has brought about the formation of a pustule. If you really want to take it out, you have to recognize where it is and then cut it open to squeeze it out. After that, you are rid of the pustule and will not be hurt again. So, in the same way, you need to recognize and repent the negative deeds you have done, and then go through the purification process to remove them. This is a very important part of the purification process. The fourth one, the power of resolve, is a strong commitment or conviction to not repeat these kinds of negative deeds again in the future. If that fervent commitment or intention is not present, then however much you have been purified, you are still not completely purified. You should think that even if you have to give up your life, you still will not repeat the same mistake, misconduct, or sin. Your various kinds of negative karma can only be completely eradicated through this intensity, this strength of conviction. Not repeating the same misdeeds again is very important and also very difficult to do. In order to have this happen, you need to apply the third power, that of regret, to see the negative side of these misdeeds, and to develop a complete revulsion for repeating them. When that happens, you will strongly feel the commitment to never do them again, and that is the basis of true purification. Generally speaking, the real basis of all of the realizations and attainments that result from our practice is our samaya and observation of the vows. Observing the vows and samaya becomes the main essence of Vinaya. 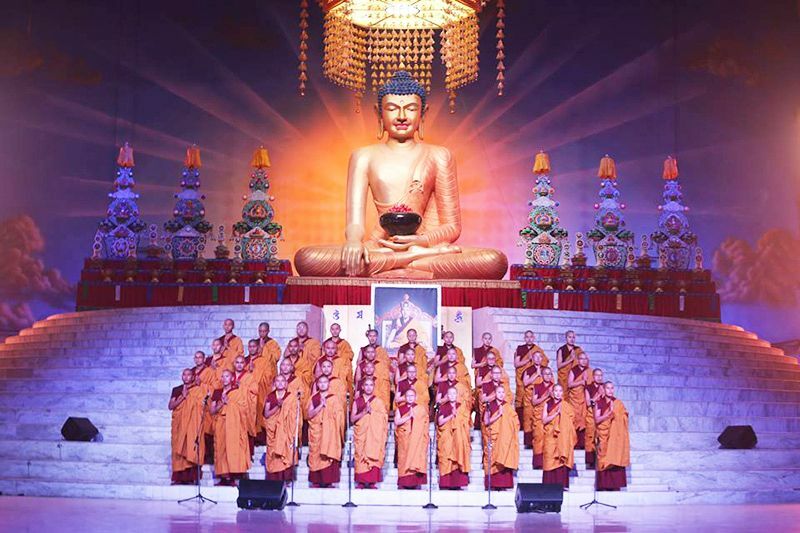 It is said in the Vinaya that if you keep the Vinaya Vows in a proper way, even if in this life you cannot attain any of the stages of realization such as the stream-enterer, in the next life, even upon hearing one verse of the Buddha Dharma, you can attain a very high realization such as the seeing stage. The life story of Shariputra is a good example. It is due to the power of observing vows and samaya. In a same way, the tantras also stress the importance of keeping one’s samaya. It is said that if you truly keep the samaya, then even if you have not practiced or meditated much in this lifetime, within about eight to sixteen lifetimes, you can still naturally reach the seeing stage or obtain enlightenment. Therefore, it is important not to give up what you have promised or committed to do. When you break your promise or vow, even in this life, it can create a difficult situation or great discouragement for you. So therefore, it is very important to keep the vows and samaya. Although at times, of course, we may break some of the vows of samaya. We then need to purify that; we need to bring it back. We should not overlook that or take it lightly. The important thing is to take it very seriously. All in all, the practice of Vajrasattva is for purification of all kinds of negative deeds and obscurations. It is especially effective for purification of breaking vows and samaya. Through the Vajrasattava practice, one can restore the broken vows and the failing promises, and even make them stronger than before. It can also compel one to become even more serious about the various vows observed. When some people think of the practice of Vajrasattva, they immediately start with the visualization, thinking such things as: “What’s the color of Vajrasattva?” and “Where are the hands?” and “What does each hand hold?” They forget about the repentance, the power of regret and resolve, and the revulsion of misdeeds. Though it is good to have a clear visualization of Vajrasattva, it is even better to have these four powers present in your practice to truly make it a practice of purification. When you do the Vajrasattva practice, you recite the long one hundred syllable mantra and count the number of recitations toward the mantra accumulation. At the end of the recitations, you can do the six syllable mantra: Om Vajrasattva Hum. This you can do a few times but the main recitation is the long one. Usually for the Vajrasattva practice, we recite the long mantra a hundred thousand times. However, when it comes to the first preliminary practice of ngondro, the refuge and prostrations, it seems that some Westerners have difficulty with the prostration part. Therefore, I have made an exception: you can do at least one thousand prostrations. As to the other parts of the ngondro practice, I have not made any changes, and you shall observe the one hundred thousand times of accumulation as it is in the traditional version. However, I do not mean to discourage you from doing one hundred thousand prostrations. You are very welcome to do so. After you finish a thousand prostrations, if you have more time you should continue doing more prostrations. Simply do not use the one thousand prostrations as an excuse for not being able to practice. Before we get into the practice of Guru Yoga, we need to do the refuge and generation of bodhicitta. You should feel that you and bodhicitta are united into one meaning, that you are inseparable from bodhicitta, and only then proceed with the Guru Yoga practice. There are two Guru Yogas: the common Guru Yoga and the uncommon one. The uncommon Guru Yoga refers to the six yogas of Naropa, and there is not enough time for that here, so we will only talk about the common Guru Yoga. The Vajrayana is considered a quick path or a shortcut, and the main reason lies in the devotion one has towards one’s guru. In some traditions, it is said that when you visualize or meditate on the lama, you should do so as the lama is in his/her current living form without turning him/her into Buddha or a bodhisattva. That is sometimes said to be more effective. But here, in the general Guru Yoga practice, we visualize the lama as Vajradhara, Dorje Chang. Why do we visualize the lama as Vajradhara? It is to dispel our view of the lama as an ordinary person; we need to have this pure vision of the lama as the omnipresent Lord Vajradhara. According to the Vajrayana, we try to transform our ordinary way of seeing things. Therefore, to begin with, you also visualize yourself as the yidam. Although you can visualize yourself as any of the yidams, in the Karma Kamtsang lineage, the common yidam is usually Dorje Palmo, Vajravarahi. So therefore, you should visualize yourself as Vajravarahi. Thus, it is very important to visualize Vajravarahi in the correct way; that is, to visualize Vajravarahi as the union of emptiness and appearance, together, at the same time. In other words, visualize everything turning into emptiness, and out of that emptiness appears the form of Vajravarahi. See yourself in the form of Vajravarahi, in which emptiness and appearance are inseparable. With this kind of understanding, visualize the form of Vajravarahi. Then on top of the head of Vajravarahi is the lama as Vajradhara. 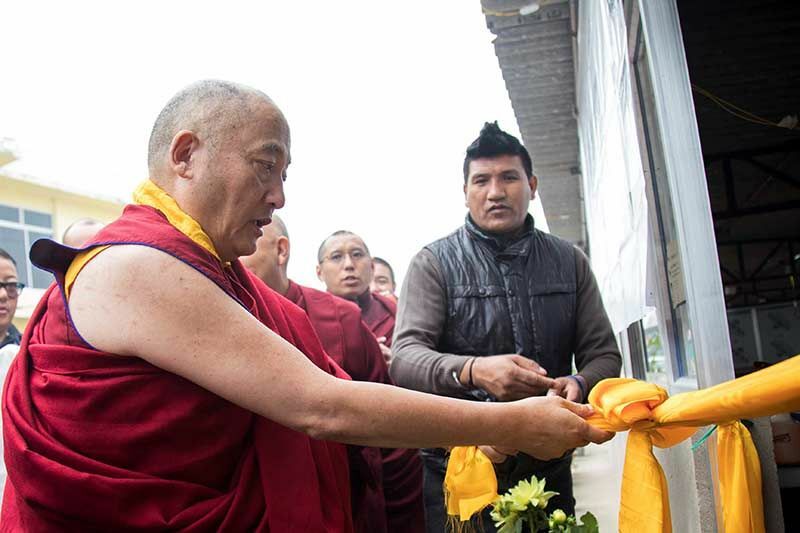 After the visualization is complete, do the seven-branch prayer as an offering to the lama. In Vajrayana, when you visualize yidams or deities, the first thing is to view them as the union of wisdom and skillful means. That is, first you have to understand that the true nature of all dharmas and all phenomena is emptiness. Even if you do not realize it completely, thinking that “this is emptiness, that is emptiness, and everything is emptiness” is good enough for here. Building on this understanding, you deliberately give rise to the form of the yidam. In this way, within one consciousness there are two parts: the first part is that everything is emptiness, and the second part is the clear display of appearances. So therefore, the one consciousness does two activities at the same time; that is, employing skillful means and wisdom. The wisdom is in seeing the emptiness, the nature of all phenomena. The skillful means refers to the various forms of the visualized deities. Additionally, when we visualize a deity, that deity has the qualities of an enlightened being. There is something very special in Vajrayana which I’ve taught under the Bodhi Tree at times. It is that we use the causal principle, the principle of cause and condition, to apply the result of enlightened experience right at the beginning of the practice by working on the union of wisdom and compassion. Through this kind of practice, one can obtain the realization of the union of Dharmakaya and Rupakaya. Although in Prajnaparamita vehicle it talks about wisdom and compassion as well as Dharmakaya and Rupakaya, it does not clearly state the cause for the direct realization of Dharamakaya and Rupakaya. In Vajrayana, when doing the visualization, it clearly tells us that one consciousness embodies both wisdom and skillful means just as we visualize that the yidam appears out of emptiness. This is the reason why Vajrayana has been described as a vehicle of fruition or a quick path. In summary, when practicing Guru Yoga, we first generate bodhicitta. Secondly, we visualize that everything turns into emptiness and the form of the deity appears out of this emptiness. Next, we visualize the lama as Vajradhara above our head, etc., following the sequence. Now, when you visualize yourself as the yidam, Vajravarahi, there are a few points that need to be noted. First, you should visualize it very clearly. Second, you should also have the pride of that deity. It entails you to have the conviction that you are Vajravarahi. Next, visualize Vajradhara on top of your head. Since you then have to visualize yourself offering the seven-branch prayer to Vajradhara, it is extremely important you have a very clear visualization of the yidam. At that time, your pride at being the yidam shall lessen a little. Otherwise, at that point, you might think, “I am already the yidam, Vajravarahi. Why do I still need to make offerings to the lama?” Therefore, before making the offering, you should lessen your pride, but maintain the clarity. 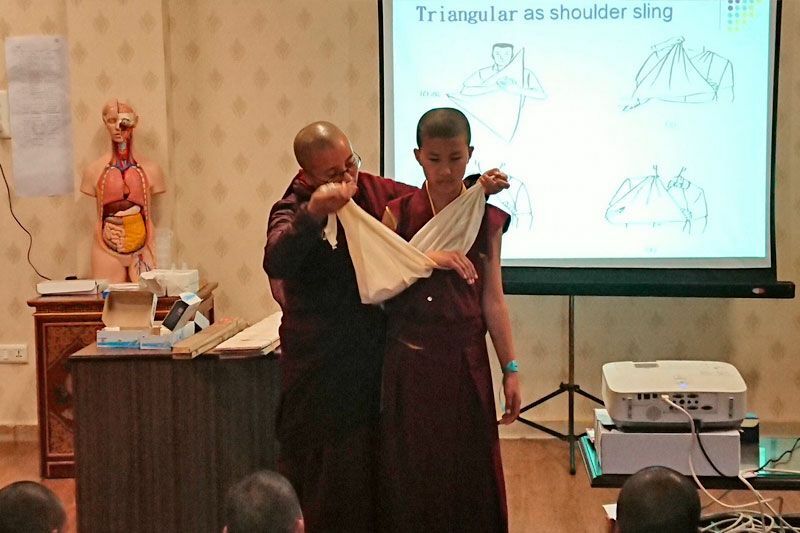 Next, you direct the seven branch practice to the lama and see the lama as the embodiment of the four kayas. Then pray with complete devotion. When we talk about seeing the lama as the embodiment of the four kayas, you need to understand the four kayas very well, or it will become difficult. Therefore, the key point of this part of the supplication is that you shall truly feel and see the positive qualities of the lama, however small they might be. Strongly reflect on any positive qualities you see in the lama and then make the prayers. [HHK] Pray from your heart. Pray from your heart, and you will feel that the lama is pleased. The delighted lama then emits lights to bless and purify your three gates. Then you receive the three empowerments. Now we have to stop here to give out the stones. If there is too little time left, then I am afraid I might have to throw stones at you. I am very happy that you could all come and that we could meet here. I know that you have come from fifty-six different countries. I could not prepare very well, but we did all come here and meet. For me, that which I am saying in the teaching is not the most important thing. More important is that we could see each other and be in the same place. That is very important to me. [HHK:] OK, I have really enjoyed seeing you all with my two eyes. I am very happy that we shared these three days together. I feel that I have made a connection with everyone of you, especially by reading and answering your questions. You have lots of questions. Though I could not answer all of your questions, I have more or less read through all of them. [HHK:] Thank you all very much for your questions. 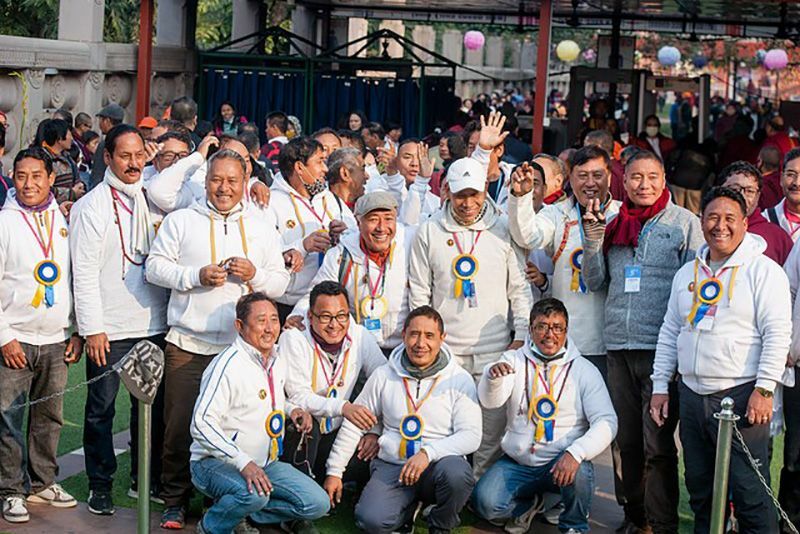 [HHK:] I hope to see you all again and again, maybe at Kagyu Monlam next year. Thank you very much. Thank you. First we will recite the prayers and then do the distribution of the stones. When we pray in the Kagyu Monlam, we do not merely pray with words. I can almost visualize that each word in the prayers is uttered out of our compassion, and it is almost like golden letters emitting out of our mouths that permeate everything in the world, like air. As the golden and compassionate words of the prayers pervade all places, they congregate everyone’s benevolent minds together. This very power of compassion and the power of the prayers will dwell in this world for a long time. The meeting of us will be like the reunion of the mother and the child, full of warmth and compassion. Praying like this, we have blessed the stones in the Kagyu Monlam. I hope that as you bring back the stone to wherever you are from, you also bring back this feeling of love and compassion to every corner in the world. Although we live in distant places, in my mind I always feel your presence. I pray that you become a light, reflecting brightly wherever you are in the dark world, and that I can see you clearly like stars everywhere. I pray that you become a light wherever you are in that very place that would lighten the darkness of problems, sufferings, wherever they may be in this world. Ani Miaorong, Ani Renzhan, Khenpo Tengye, Chi-ying Chang, Dean Hill, Dorophy Tam, Jeffrey Chen, James Forro, Kate White, Laura Hill, Lynn M. Wilson, Max Maksimik, Min Yao, Pi-Chun Chen, Sheena Shii, and Sue-Ching Chang.